Sweet and savory, smooth and crunchy – these patties have it all going on. 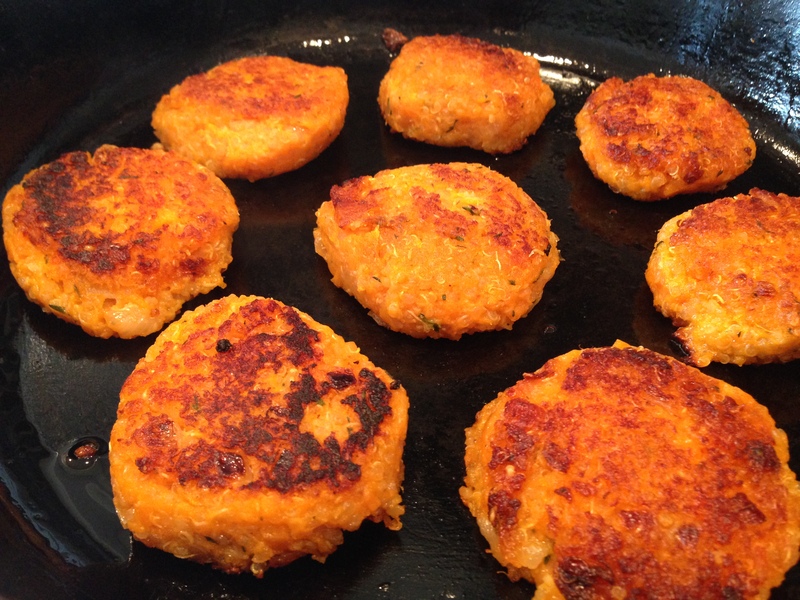 After the sweet potato and quinoa are cooked, these patties come together quickly. The uncooked mixture may be kept in the refrigerator for 4-5 days, so you could make these in advance of when you’d like to cook them up. Make small 2″ patties and serve them as an appetizer with the savory herb drizzle as a dipping sauce. Larger size patties make a good main course or side dish. The key to getting a brown crust on the outside is to cook them in a cast iron skillet. Don’t skip the savory herb drizzle, it is essential to the awesomeness of the patties. 1. Preheat oven to 400 degrees, pierce sweet potatoes with fork and bake for 45 minutes or until soft. 2. While sweet potatoes are cooking, cook quinoa: Rinse quinoa well in a fine mesh strainer. Bring a tad less than 2 cups of water to a boil in a small saucepan. Stir in quinoa when water boils. Simmer, covered for about 15 minutes, or until all water is absorbed. 3. In a sauté pan over medium-low heat, cook shallots in a tablespoon of coconut oil with a three-finger pinch of sea salt until they are translucent. 4. Add garlic and cook one minute more, stirring continually to prevent the garlic from burning. Add thyme at the very end and mix well. 5. When sweet potatoes are cool enough to handle, remove skins, mash with a fork to remove all chunks and place in large mixing bowl. 6. Add shallots, quinoa, 1/2 teaspoon sea salt (more to taste), a bit of fresh cracked pepper to large mixing bowl with sweet potatoes and stir until well combined. 7. Form mixture into golf ball size ball, flatten into a patty, and cook in coconut oil in a hot cast iron skillet for approximately 2 minutes on each side (you want them to brown up and crisp!). Cook patties in batches taking care not to overcrowd the skillet. You’ll need to add coconut oil between batches and scrape away any broken bits. 8. Finish with a generous sprinkling of fresh thyme leaves and some finishing salt. 9. Serve with Savory Herb Drizzle.